Want to know more about decentralized applications (Dapps) and Ethereum? What better way to learn than to get hands-on and build a decentralized pet shop! 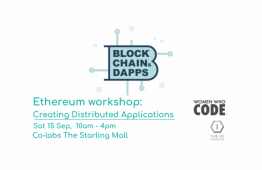 Come and dive into a 5-hour crash course with Kenneth Hu, blockchain developer/evangelist and blockchain/DLT meetup community organizer, where we will learn what decentralized applications are and how to build one on the Ethereum platform. In collaboration with: Women Who Code, a community of technology enthusiasts and lifelong learners and The IO Foundation, a nonprofit advocating for Digital Rights who believes distributed ledger technologies are an asset to achieve their mission.